Experience the Highlights of Scotland on this leisurely 2-day tour, which includes a comfortable stay by the banks of Loch Ness, a woodland walk, time to explore evocative Culloden Moor and awe-inspiring Glen Coe. 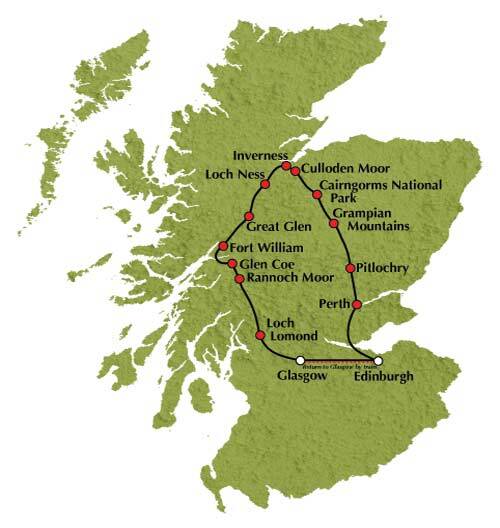 On this two day tour discover essential Scotland. From towering mountains and ancient castles to scenic lochs and charming villages. This is a great introduction to the Highlands of Scotland! From Edinburgh and Glasgow we make the short journey to Loch Lomond, Britain's largest lake. Enjoy a stop in the pretty village of Luss to admire stunning views of the "bonnie, bonnie" banks. As we head into the highlands the loch becomes fjord-like and as this is "Rob Roy” McGregor country we'll hear entertaining tales of his exploits! At the little village of Bridge of Orchy we commence our ascent of the Black Mount with wonderful views of Loch Tulla below. At the summit we reach Rannoch Moor, one of the most unspoilt areas in Europe. The outstanding beauty of Glen Coe sits in stark contrast to the tragic tale of the Massacre of Glen Coe in 1692, when Campbell soldiers slaughtered forty of their MacDonald hosts. This infamous act of treachery remains a matter of controversy. Fort William sits in the shadow of Ben Nevis. From here we travel through the Great Glen, with its wonderful loch-side views to reach the pretty village of Fort Augustus by the banks of Loch Ness, our home for tonight. Invigorated by a hearty breakfast, explore your immediate Highland surroundings. Drive along the banks of Loch Ness then have the chance for a sail on the loch* or visit to atmospheric Urquhart Castle*. A short drive takes us to the city of Inverness, the Capital of the Highlands, and on to Culloden Moor, the site of the last battle ever fought on British soil. Bonnie Prince Charlie’s Jacobite troops clashed here in 1746 with the British Army under the command of the Duke of Cumberland. After a bloody battle, the Jacobites were routed and Highland life was changed forever. We enter the picturesque Cairngorm National Park, a protected area of natural beauty, as we journey through the Spey Valley against the stunning backdrop of the Cairngorm Mountains. The scenery changes to wilder mountain panoramas as we make our descent of the Drumochter Pass, the main route since the earliest of times into the Highlands. Our coach tour continues with fine views of Blair Castle, the seat of the Duke of Atholl, the only man permitted to have his own private army, The Atholl Highlanders. We make our way southwards to the valleys, glens, rivers and lochs of Highland Perthshire. Then the final part of our journey back to Glasgow and then the short journey back to Edinburgh. Tour Highlights: Callander, Rannoch Moor, Glen Coe, Fort William, The Great Glen, Fort Augustus, Loch Ness, Inverness, Culloden Moor, Cairngorm National Park, Pitlochry and Highland Perthshire. We regret that children under the age of 3 are not carried on this tour.